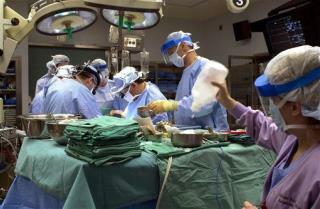 (Newser) – The number of hearts available to thousands of Americans requiring a transplant every year could increase by up to 30% if a new piece of medical technology developed in Massachusetts is approved for use in the US, the MIT Technology Review reports. TransMedics' Organ Care System—known as "heart in a box"—is a sterile chamber with oxygen, blood, and nutrient supplies that keeps a heart pumping outside the body until it's ready for transplant. Donor hearts typically come from patients who are brain dead but whose circulatory systems are still functioning, explains the Review. The problem has always been the shortage of brain-dead patients. The OCS changes that, allowing surgeons to remove hearts from the recently deceased and "reanimate" them for transplant—thus opening up a much larger pool of potential donors, notes Popular Mechanics. Wow. Using brain dead hearts. We have more potential donors if you consider most Obama voters. resulting in eternal youth, robust health and countless more years relishing every moment of vibrant, joyous life on earth. So much blogging to do; so much Facebook; so many emails to send to beloved friends; so many races to run and teams to cheer for; so many children to create so that some day their hearts can be rejuvenated. and then their children. and then ....... Earth 2015: war, hunger, slavery, desperation, hopelessness and death, unless you read only the scientific discoveries and celebrity news. Kill the messenger and talk about mental illness: you have nothing else!